A teenage boy who was shot outside his high school this week was set up by an ex-girlfriend, charging documents say. Police have charged 17-year-old Zanaya Bryant and 18-year-old Anthony Hollingsworth with attempted murder and related charges in connection with the shooting. The victim and Bryant were previously in a relationship, according to charging documents. Police say the former couple had been in contact with each other and agreed to meet at Oxon Hill High School Monday afternoon. When the victim got into Bryant's car, he saw two other people in the back seat. One of the passengers grabbed the victim and told him to give up his belongings. 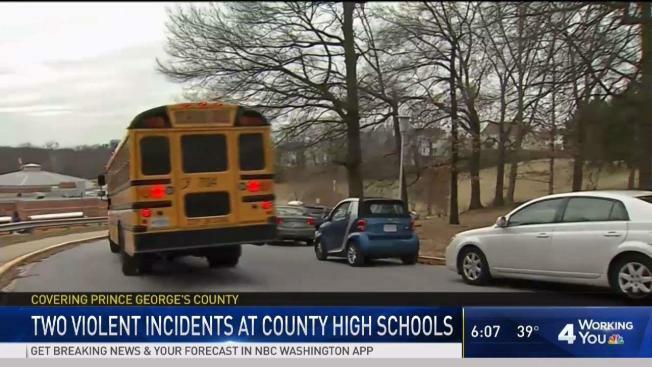 Prince George’s County, Maryland, police said a teen was shot in chest and walked into his high school, seeking help, on Monday night. News4's Shomari Stone reports. As the teen tried to fight the suspect off, a gunshot went off. The victim was able to free himself, but it wasn't until he was back inside his school that he realized he had been shot in his chest. "He was set up. He was invited to get into that car by someone he had a previous relationship with," Prince George's County State's Attorney Angela Alsobrooks. The victim was taken to a hospital and was released several hours later, police said. Using surveillance footage from the school, police were able to identify the car used in the shooting as a white 2010 Mercury Mariner. A few hours later, Hollingsworth called police and reported that his car, a white 2010 Mercury Mariner, had been stolen from him hours earlier. When investigators realized the car matched the description of the vehicle used in the shooting, they asked Hollingsworth to meet with detectives, a charging document states. Hollingsworth said he had been carjacked, but his parents told investigators that he was involved in a relationship with Bryant, the victim's ex-girlfriend. Police showed the victim Hollingsworth's photo, and the victim identified him as the passenger who grabbed him in the car. Hollingsworth has denied involvement in the shooting, charging documents say. Alsobrooks said she's planning aggressive sentences against the perpetrators in Monday's shooting. "We will not tolerate violence in our schools," she said. Bryant and Hollingsworth will appear in court for a bond hearing Friday. Police are still looking for a third suspect in the case.